Four years ago I tried the Highland Park 30 Year old for the first time. I must say, it is a ‘happy-to-see-you-again’ moment. Back then I called it the best Highland Park I had tried so far and that still holds true (although the 2012 Amazing Cask from Malts of Scotland came very close). Yes! That nose! Strike that. That Nose! Creamy and sweet on all kinds of dark and candied fruit – peach, apricots, sultana – with a good dollop of heather honey and a truckload of toffee. Add some brown sugar and beeswax, liquorice and milk chocolate. The whole if finished with some leather. This is simply magnificent and easily entertains you for a full 15 minutes. Delicious. On the palate it is quasi creamy and immediately pleasantly sweet, but with a trace of salt and a touch of smoke. Mildly drying as well. Quite spicy. The fruit from the nose reappears, but is somewhat overpowered by the spices, unfortunately. Nevertheless, it remains a grand malt, do not worry! You can easily call this a long finish, with sweet peat and dark fruit at the death. This truly is a grand Highland Park, but unfortunately the price has become unreachable (to me, at least). I cannot afford 750 to 900 EUR for this bottle (it is not an Auchentoshan after all!). Sweet smelling, nearly cloying, long lasting, hints of sherry, very balanced, consistent and intriguing. There is something earty, seaweed hits and salty(?) Hard to pick any particular flavours but will keep trying. Overall this feels refined, particularly due to the long smooth finish but perhaps I am not refined enough to nail the flavours but loved it. The Highland Park 30 Year Old is considered to be one of the best whiskies produced on Orkney, but unfortunately costs about 435 EUR. I can only afford a miniature, but I do believe this is a good way to discover expensive whiskies. Oh, God, what a great nose! Very creamy and sweet on honey and heather like we are used to from HP, but with loads of extras. In no particular order: brown sugar (cassonade graeffe), peach, beeswax, vanilla, liquorice, Orkney peat, milk chocolate, biscuit, mint, aniseed, toffee, apricots, leather, nutmeg. I could go on. I think the word complex was invented to describe this nose. Very creamy on the palate with the same fruit as on the nose and more. Everything comes back and is upholstered with dried fruit like raisins and dades, but also figs and oranges. Make that orangettes. A great whiff of smoke and briny element. Yep, my night is made. The oak makes it slightly drying, but not disturbing in the least. Wonderfully long finish op spices, peat and all the sweetness your heart desires. Wow, the 18, 21, 25 and now the 30 Year Old. It keeps getting better. Unfortunately, this is the end of the line for me, for I cannot afford the 40 and 50 Year Old (hint, hint). This is certainly one of the best Highland Park I have had the good fortune to try. A very nice review. To me the 30 is the most complex, best balanced and most satisfying of the whole HP range up to that year. I much prefer it to the 25 I had, which was unfortunately a little tired. Not the 30! Full of life and flavor. And it has the balance and depth I find so missing in the 18. Now if I had to be on a desert island with the HP 30 or the Talisker 30, which would I choose......? I've tried quite a few HP distillery offerings over the past couple of years and have been looking forward with great anticipation to the 30 year bottled at 48.1%. This retails in London for about £230 with the 5cl available at £19. As one would expect this has a beautifully deep toffee honey colour and sits in the glass elegantly. I tried two drams with and without just a teaspoon of water. On the nose I found, old oranges, cinnamon, pineapple and coconut, the body was thick and oily with a strong malt blast, tastes of deep oak and mahogany and bees wax with a surprisingly short but deep orange/marmalade finish. I left the second dram to sit for an hour added a drop of water which didn't really change the experience. I'm glad I tried this but this didn't really inspire me in anyway, I just felt I was drinking very old whisky. I still think the best HP's are the 16 yo and 18 yo's for balance, texture and finish. I'm glad I've tried this HP 30yo but for sure I would not rush to buy it at £230 per bottle, and in fact have tried (for me) far better and more inspiring Whiskies at £50-£70, Springbank 15/18yo's and Talisker 18yo immediately come to mind as excellent Whiskies. Oldest and priciest are simply not always the best, but perhaps worth trying as part of ones's Whisky exploration. Hi Kian, I picked this up from the Cadenhead shop in London this week (didn't even know it was there) and well, this is some dram. Great little Whisky shop will definitely be going back,thanks for the heads-up. I took several drams with varying measures of water, and boy does this stuff need taming. It's like a mouthful of dark chocolate gateaux with burnt cherries, fuelled aniseed, black syrup, violet marzipan and almond cake. I've revisited after a couple of days and tried it after a fresh Mortlach 13 and Springbank 15.. definitely better as a finisher and with a cigar. Tons of mature honey, wood sap, bees wax, dark sherry and spiced ginger cake. Will be taking another dram with an equally rich Partagas D4 cigar then leaving half of the bottle a few months. The 18's aren't the best any longer, sadly to say. They have flown the coop. I've never tasted an HP 16. The 15 is not bad, but doesn't hold a candle to the old 18's, which were among my favorite whiskies of all time. Nose: Cinnamon with golden raisin and nutty toffee. Or: s'mores, & bales of hay. (Of course by s'mores I mean a strong essence of milk chocolate and vanilla [marshmallow], along with evident graham crackers and a tiny amount of heat. But the hay [or golden raisin] imparts enough freshness so it is not overbearing.) I think you could also imagine this combination of aromas as dried figs with cinnamon. Exquisite. Palate: Orange and lemon zests on entrance, over fresh strawberry. Becoming red-hot candy cinnamon with grapefruit pith. (You might get an almost chewable chocolate sensation if kept sitting in the mouth). Finally, closing with hot ginger numbness, around grassy vanilla and slightly salty toffee. Finish: Cinnamon orange zest and toffee... toffee with spicy ginger... eventually cool vanilla anise. Not as peaty as I expected (is there any at all? ); nor as fruity as I might usually like. But a refreshing yet rich vanilla-based malt that hits the right notes at the right times. No bitterness. The lasting impression is vanilla-toffee with cinnamon and ginger, but there are earthy and spicy complexities at each stage. I have just noticed the price point and do not find it justified when there are other good 'vanilla-themed' malts out there; nevertheless I am happy to have tried this. Finally got the chance to try the 30yo of my favourite range in Scotch whisky, all thanks to a friend of mine and a sample bottle. Nose: Different from the younger HP's, according to the distiller this is due to them using more refill sherry casks instead of first fill, this pulls the usually Sherry influence back. Very nice floral notes, juicy honeycomb, some fruit (mango, rockmelon, cantaloupe ect. ), notes of Heather and sweet malts, lightly toasted breads, some dates and toffee, fire roasted marshmallow. Very well balanced and sweet. Palate: thick, rich and delicious, notes of fresh toasted bread and barley, some slight citrus, thick dark honey, salted caramel, roasted bacon fat, some creamy expresso and roasted almonds, bittersweet chocolate, creamy fudge, balancing the sweetness is an undercurrent of earthiness, campfire cinders and gentle peat-smoke. So well balanced, this is a palate where you can pick out a new note on every sip. Finish: Very long, salted caramel again, rich dark toffee, sweet toasted malts, some white tea, the creamy coffee from the palate fades away into the finish, gentle notes of campfire sewn throughout the sweetness. And just like that I want a full size bottle of my own. One of my favourite things about Highland Park is that some whisky's can be described as 'peaty, sherryed, honeyed, Maritime, floral, malty, ect.' Highland Park seems to have found a way to embody all of these traits into their whisky and hold them together with perfect balance. Thats what makes this whisky so damn good, all the notes seem perfect together with no flavour overpowering the other. More restrained on the sherry aspect then the younger whisky's HP's range but far more complex. One of my favourite whisky's I've tried so far. Thanks, I loved the 21 (47.5%) as well. You definantly should try the 25yo as well, that one was great. Nose: Toffee, oregano, spearmint, a whiff of sherry, raisins, salty ocean breeze, Earl Grey tea, graham crackers, milk chocolate fudge, s'mores, almonds, gremolata, a bit of smoke, charcoal, hay, toasted oak, and even a smoked salmon note. Incredibly earthy with plenty of sweetness. Taste: Sweet and tart. Honey, salted caramel, figs, mint, roasted fennel, lemon zest, almonds, cut grass, sea water and sand, pine needles, pepper, campfire smoke, gentle peat. Very oily and mouth-coating. Finish: Dry, herbal Orkney peat, licorice, tea, bitter herbs, a bit of toffee, cherries in syrup, and mixed nuts. Goes on for forever and a day. Where do I start? I bought this bottle with the intention of opening it on the day of my engagement to my wonderful now-fiancée. It was a great day and I had been stressing about how my plan would play out. It all worked out well and following the party that night, I realized, "Oh yea, I get to open my Highland Park 30!" Wow did this whisky live up to my expectations. This whisky, in my opinion, is all about the earth. There are plenty of sweet notes that I expect from a sherry matured whisky, but there are so many earthy notes that not only balance the whisky, but make it very interesting. I find it simply stunning. Of course, a bit of bias probably exists because of how much I built it up in my mind and because of the sentimental value it has, but perception can very well be reality. It's a whisky that I won't forget. Hi, I can I ask a question? On the highland park website, it states that none of their current bottles have caramel. But what about chill filtering? I suppose that this bottle being at this price range would be un-chill filtered. Can anyone who has this help me answer it? I can't find a bottle locally, but a friend will get this for me when coming back overseas. If it went as planned: congratulations on your engagement. Nice review too! One of the hardest things to do, in the modern whisky industry, is to create a good sherry whisky. With the price of good sherry casks rising like never before, the risk of getting a bad one, and potentially ruining an entire batch (With terrible sulphur notes) is more than most distilleries can handle - MacAllan's Fine Oak series, is perhaps the most prudent example of a once dominant sherry aging distillery switching to the "safer" bourbon wood. It's a shame, because nothing is really quite like an old sherry giant. Luckily Highland Park has one in their core range, and let us see how they did, shall we? Nose: That lovely dried fruity sherry smell, plenty of dried raisins, dates and figs - your classic sherry smells. Add to it the heather honey, notes of leather and almonds and you've got something I could nose all night. Taste: Very rich and oily, nice texture and an incredible viscosity, fills the entire mouth - carries over the very clear filling sherry notes from the nose, and adds just a whiff of smoke develops quite nicely, slowly but surely in a spicy direction, and ends up quite peppery. Finish: It has the "Hallelujah" moment in truck loads, completely dries your mouth, and lets you chew and chew and chew. Slightly malty, spicy while still maintaining its sherry sweetness, and it keeps going for hours. Truly a finish to behold. Funny story... I found a bottle of this at my favorite Spirit shop mis-marked. It was priced at $99 (and you could see the $414 price tag beneath the erroneous price tag). I brought this to the attention of the store manager who proceeded to tell me "If you want to but it, I'll honor the price." I first refused, but after he asked "are you sure" I took it from his hands, went to the checkout counter and paid for it with money I didn't really have. Nice review - added to the wishlist. Nose: very floral and tropically fruity. Peaches, pears, really sweet and highly elegant. Some beeswax and slight estery, spirity notes. Heather and honey as well, which are Highland Park’s trademark notes. Some vanilla and nutmeg. The lightest hints of an extinct fire. Very nice although I’m missing some depth. Mouth: toffee, some lovely oranges wrapped in chocolate. Vanilla, cinnamon and ginger. Figs. Almonds. Honey. Finish: long finish on orange and grapefruit. Soft touch of smoke. Getting drier with a slightly metallic edge. This is pretty much top of my list to try next. Nose: The classic heather honey sweetness is there alongside the equally classic dark chocolate coated orange peel and ginger. There is something else, lighter and more citric as a back note with a slightly metallic note that makes for a wonderfully fresh nose for a malt of this age. Feel: For me this is near perfect, rich and mouth coating yet not at all cloying. Taste: Surprisingly light at first with citrus, lime and a little grapefruit before smokey edges drift in with the ginger, chocolate and orange from the nose. The oak balances beautifully with a touch of toffee and cinnamon. Finish: The oak takes grip but within the limit and a coppery sharpness adds balance. Persistent ginger and orange with a dark caramel sweetness carry through the considerable length. A truely classic malt for me. 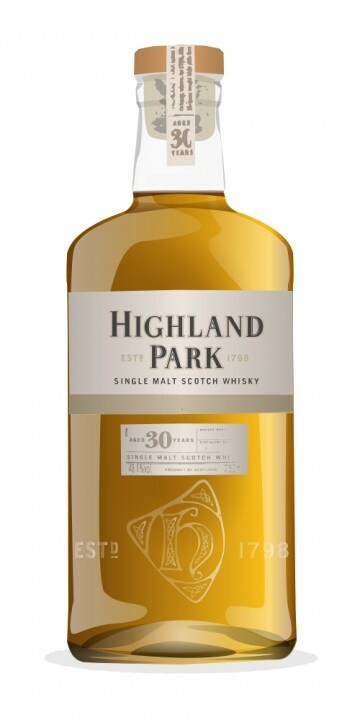 I have tried the Highland Park 30 over a few different years now and, while it changes slightly as different notes take centre stage it always seems balanced and beautifully elegant. Lucky, the 47% should be on it's way back to us again soon. HP had trouble sourcing enough casks to supply the 21 @ 47%, but they recently bought back a helluva lot of casks so that they can do just that. Tonnes better then the 25yo, it's a perfect example of an old HP. It's a great dram. Nose: Luxury, chocolate covered cherries, peat, hippy cigars (Acid brand Liquid cigars to be precise) Palate: Robust and delicate at the same time, balanced, sweet, dark chocolate, ripe berries, sherry, peat and brine. Finish: Like a muted version of the palate with a hint more peat. The burn is a flash that disappears almost before you feel it. Comment: I have no words to express my love for this whiskey. This is why we drink whisky. If you can afford to spend $350 on a bottle of whisky, buy this one.